WASHINGTON (RFE/RL) — Nagorno-Karabakh remains a “partly free” territory governed by a less repressive administration than Azerbaijan, the U.S. human rights group Freedom House said in an annual survey released this week. Freedom House evaluated “political rights” and “civil liberties” in 195 countries and 15 territories, including Karabakh, on a 7-point scale, with 1 representing the most free and 7 the least free. It again rated both Karabakh and Armenia “partly free” and kept Azerbaijan in the “not free” category of nations surveyed. What is more, the “Freedom in the World 2016” survey further downgraded Azerbaijan’s ratings, giving the authorities in Baku a median score of 6.5. “Azerbaijan’s political rights rating declined from 6 to 7 due to an intensified crackdown on dissent, widespread irregularities surrounding the November parliamentary elections, and serious violations of the right to a fair trial in cases against journalists, opposition activists, and human rights defenders,” it explained. “President Ilham Aliyev’s government used the polls to show its teeth to the democratic world, barring several foreign journalists from covering the process and imposing restrictions on international observer groups that led some to suspend their monitoring missions,” adds the report. By comparison, Karabakh’s political rights and civil liberties ratings remained unchanged at 5. The Azerbaijani government on Thursday condemned the U.S. watchdog’s latest evaluations of Azerbaijan and especially Karabakh. “Setting aside the separatist regime created in the occupied territories of Azerbaijan in the latest annual report is yet another instance of bias shown by Freedom House,” Foreign Ministry spokesman Hikmet Hajiyev said, according to the APA news agency. 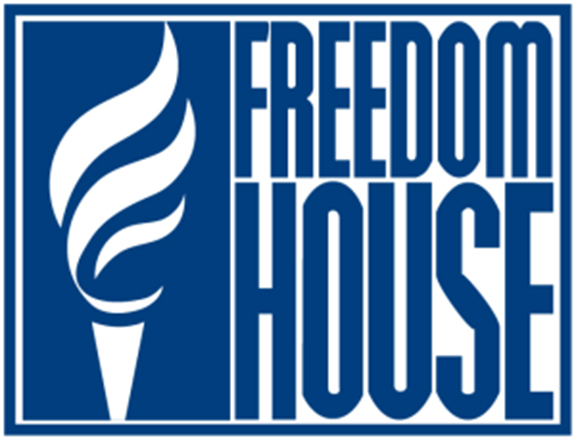 Like other Western human rights groups, Freedom House has repeatedly decried the arrests and imprisonment of dozens of Aliyev critics in recent years. In 2014, it urged the United States and the European Union to consider imposing sanctions on Azerbaijani officials involved in human rights abuses.